a home for my heart: Ubuntu. Say it, it's fun! 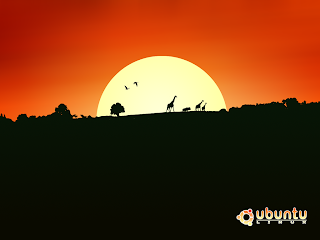 Ubuntu. Say it, it's fun! I have lots of adventures and thoughts on recent changes running around in my head lately. But whenever I try to write about them (which isn't often enough) the words just seem stale. Maybe I've let them sit in my head for too long. Maybe I'll tell you about a fresh new adventure that is happening right now. Lost Boy installed Ubuntu (Linux) on my laptop! I frequently complain about how slow my laptop is. It is pretty old. I try to uninstall programs that I don't need, but I'm pretty sure the registry needs to be cleaned up and freeware just isn't fixing the problem. So we decided to wipe my hard drive. I transferred ALL of my documents, my favorite programs, and my Chrome profile to our external hard drive (EHD) last week. (By the way, Lost Boy found our hard drive on sale. It has a terrabyte of memory. That is super huge. I have about 27 GB of data on the EHD and we have way more than 27 GB of photos and audio files on the EHD, but the drive is less than three quarters full!) There is nothing on the computer that I'm worried about losing. Lost Boy installed Ubuntu two days ago, and we've been playing around in it. It is fun to explore new menus and see what new programs are available. Ubuntu isn't as different from Microsoft Windows as Mac is, so it has been pretty easy to find all of the stuff I want to use (Internet, spreadsheet, etc.). One of the great things about Ubuntu is that it is Open Source, which means it is free. All of the programs (and games) available for Ubuntu are free too. Ubuntu is a South African ethical ideology focusing on people's allegiances and relations with each other. The word comes from the Zulu and Xhosa languages. Ubuntu is seen as a traditional African concept, is regarded as one of the founding principles of the new republic of South Africa and is connected to the idea of an African Renaissance. A rough translation of the principle of Ubuntu is "humanity towards others". Another translation could be: "the belief in a universal bond of sharing that connects all humanity". Windows is still on the laptop, so the next step in this adventure is to learn how to wipe the hard drive. We've downloaded Killdisk and the 31 page guide. I started reading the guide and learned that whenever we delete things or move them to the recycle bin, they're not actually getting deleted or overwritten. They are still hanging out on the computer somewhere. If you know where to find them you can restore them. Killdisk completely overwrites whatever you're wiping so it can't be restored. I think we're going to take it slow and just try to wipe folders that we know aren't important to practice. Unless I get impatient and decide to try a huge chunk of the computer all at once. Sounds like a fun project. I personally would hate it, but it sounds like you're enjoying yourself. Good luck!